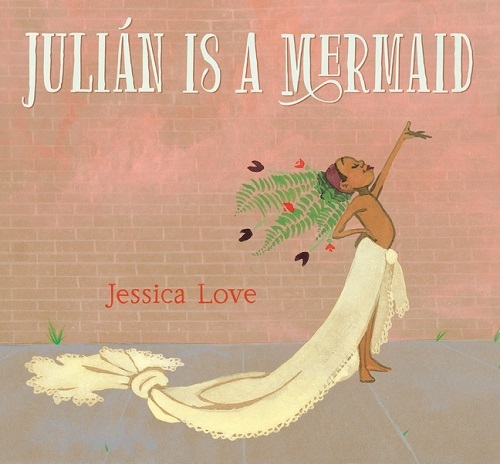 I’ve got a review over at BookPage of Jessica Love’s Julián Is a Mermaid (Candlewick, April 2018), a book you’ll want to be sure to read this year. The review is here. Please, do go read all about this spectacular book. 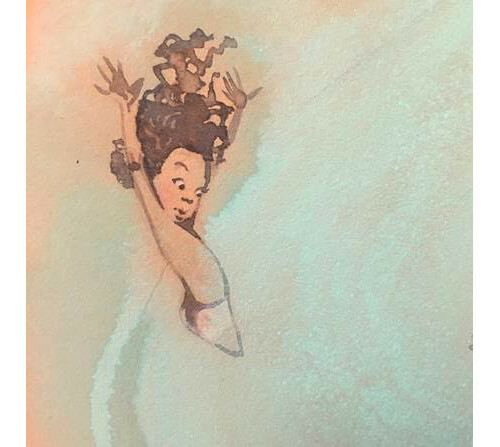 And then come back, because I’m following up here at 7-Imp today with a chat with Jessica, as well as some art from the book (and some preliminary images). That is below. Jules: Have you paid attention to early buzz for your book? What does it mean to you to have such love for the book even before its release date? Jessica: Um, yes, I have been reading the reviews like they’re letters from my sweetheart away in the war. It’s funny: I’ve been an actor for the last 13 years, and there is a real thing in the theatre community about not reading reviews. But as an author/illustrator, I have been so thirsty for some kind of response, and I cannot tell you how enormously gratifying it is to see the book going out into the world and fulfilling its function. Because a book, especially a children’s book, I think, has a function: it’s meant to open a door to conversations. So, in a way, I didn’t really know if the book was going to work until people started actually reading it. I didn’t know if any of the themes I was trying to elevate or the questions I was trying to provoke were going to land. So, yes, the responses have been more gratifying than I can adequately explain. Jules: I’d love to hear about the genesis of this story, if you’re so inclined to share. Is Julián based on someone you know, by chance? Jessica: Julián isn’t exactly based on anyone I know, but there is a little bit of an origin story. When I first got the idea, I was with someone who had an older brother who was trans. And when he transitioned to start living as a man, I remember it provoking all of these questions about how to explain his transformation to some of the younger family members — nieces and nephews. 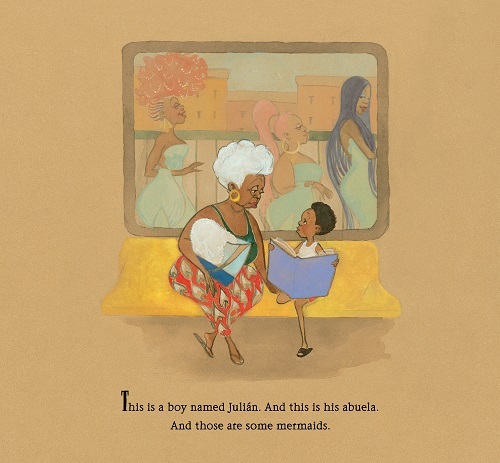 And it got me curious about what sort of literature there was out there for families looking to have conversations with their children about identity — and how sometimes a person has to do a little more work to create the proper cover for their own book. I wanted to make something that didn’t feel didactic but that gave children a chance to experience this character’s inner life and identify with it. I wanted to give kids who identify with Julián a chance to see themselves reflected, but I also wanted kids who don’t identify with him a chance to get inside his experience and feel what it might be like. Jules: I love how the brown on each spread lets the colors pop off the page. Did you actually paint on brown paper? Jessica: Thank you! It’s one of my favorite things about the book. The first several drafts I did of the story (I did a lot of drafts before I even got an agent and sold the manuscript) were on white paper. But I kept running into this problem, which was that the contrast between the brown skin of the characters and the bright white of the page made it so that when I scanned the images digitally, I lost a lot of detail in the character’s faces. I kept thinking over this problem, and then one day I tried painting on a paper bag — and the colors just exploded off of the page. Suddenly, there was all this subtle detail that was visible in the character’s faces, because the colors weren’t at war with this sterile, blindingly white paper. I’m an actor, and it made me think about my dark-skinned actor friends’ experiences on professional shoots when the photographer or cinematographer would come without the right equipment to light dark skin. This happened really frequently. The default lighting equipment they would bring would be for lighting white-skinned people, and my friends would have to explain that if you lit their faces with reflected white light, instead of gold, they wouldn’t show up as well in the photograph. But the photographers often didn’t know this, and my friends would have to explain it to them. There is an invisible default setting for “whiteness,” and it’s easy to forget that if you happen to be white yourself. But once you notice it, it becomes obvious that it’s not actually a default; it’s an option, one of many many many other options. The whiteness of the paper was physically getting in the way of my ability to tell the story. And as soon as I drew the characters on brown paper, it was like the story breathed a sigh of relief. Brown is the home-base color for this story, and I’m so glad I figured it out in time. Jules: What was your favorite spread to paint, if you can even pick? Jessica: I suppose my favorite spread is Julián building his costume in Abuela’s apartment. It’s a bit of a tribute to Hilary Knight’s tantrum sequence in Eloise. 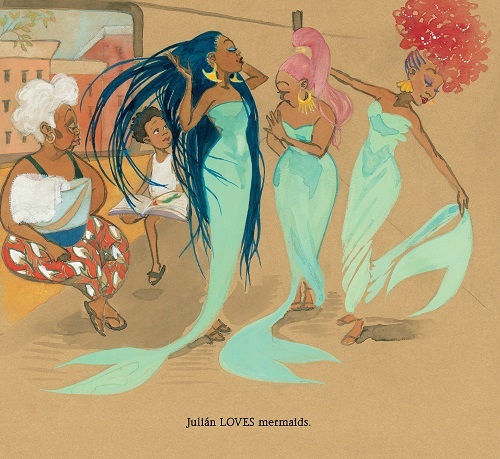 Jules: Do you feel like your work in acting informs your illustration work at all? Jessica: Oh, that’s such a good question. I think they are actually just different expressions of the same impulse. When I was a kid, I would spend hours and hours a day making up stories — and illustrating them, while I sort of did everybody’s voices. 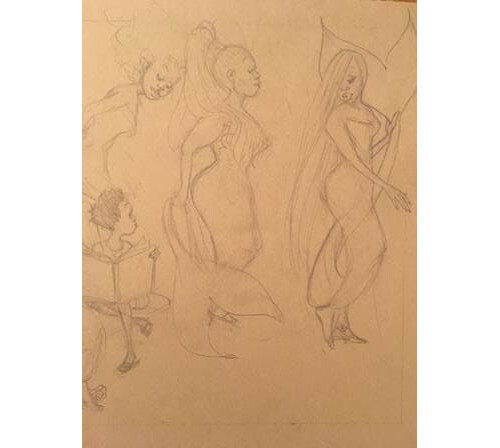 With acting, my body is the medium, and with drawing the medium is paper. But the goal is the same: to tell a story that feels true. I think one very important lesson I’ve learned in the theatre that proves to be just as important in a visual medium is that if you aren’t being specific, then it’s not going to feel truthful to anybody watching (or reading) it. And if it doesn’t feel true, people aren’t going to have an experience with it. 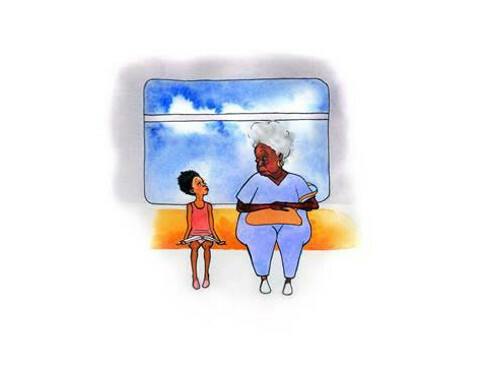 I wanted not just Julián and Abuela, but everyone in the story, to feel like a specific person with a whole life behind them. I wanted their experiences to feel specific. And that is the strange inverse miracle of specificity-in-art: the more specific you get with a character, the more broadly people are able to identify with them. Jules: Your parents are both artists, yes? What mediums do they work in? Are they painters? Do they also illustrate? Jessica: Yes, they are both artists! My mom is a basket-weaver, and my dad is a potter. Some of their work is collaborative, but they also both work on their own as well. Their studio is right next to our house, so I grew up with them working at home. Neither of them spent the majority of their time drawing, but my mom does beautiful watercolors when she is in the mood. They’re artists, so they are both that everything-we-touch-is-beautiful kind of person. Jules: Are you going to make any more books any time soon? Jessica: YES. I have a couple ideas that I’m messing around with now. One is an immigrant story — about parrots. One is a posthumous book of animal poetry that my grandfather wrote for his grandchildren. And the third is a heroine adventure story. I want to do this for the rest of my life. Note: There’s more from Jessica here at Let’s Talk Picture Books . . .
JULIAN IS A MERMAID. Copyright © 2018 by Jessica Love. Illustrations reproduced by permission of the publisher, Candlewick Press, Somerville, MA. All other images reproduced by permission of Jessica Love. Thank you for the interview, Jessica and Jules. 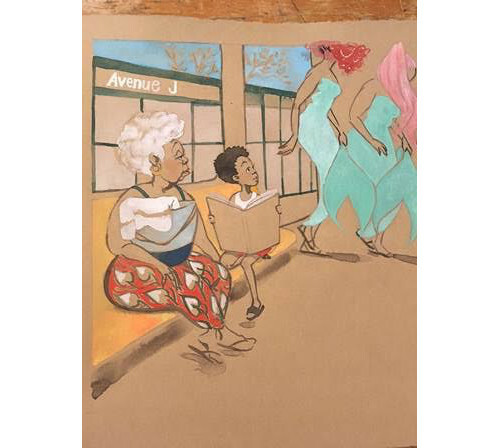 Jessica, your art is vibrant and lovely, and the brown paper is great. I look forward to reading this! “I wanted not just Julián and Abuela, but everyone in the story, to feel like a specific person with a whole life behind them.” < —- YES, yes, all the yesses! I watched my nephews pore over this book, paging through it repeatedly, pointing out background characters, marveling over bodies and hair and details… over and over again. They clearly were thinking SOMETHING, but didn't share what, they just started again. And again.